What about one of the oldest e-commerce platform? Founded in 1999, Volusion still empowers thousands of merchants worldwide to run their businesses online, but the related ecosystem is more than ten times smaller than the one available around Magento. That’s why some merchants migrate from Volusion to Magento 2. Besides, Volusion lacks some advanced features, third-party extensions, scalability, and performance provided by the Magento platform. While it is great to start an e-commerce website, you will need to switch to something more powerful as your business grows. Below, we shed light on the Magento 2 Volusion migration as well as provide a detailed guide on how to synchronize data between the two platforms. Let’s say a few more things about Volusion and then compare it with Magento before going any further. Starting an e-commerce business with Volusion is quite simple: you create your store, begin selling products, grow your business, and ask for help if necessary. That’s the basic algorithm for many e-commerce platforms, but the devil is in the detail, so every system is unique, and Volusion is not an exception. With the platform’s responsive themes and a comprehensive site builder, you can create your store in minutes. No coding skills are required! That’s one of the most essential requirements most merchants have. They don’t want to spend much time and money developing an online storefront. As a result, Volusion offers an opportunity to create a web store in the most intuitive way. And don’t forget about powerful ecommerce features provided out-of-the-box. With Volusion, you get quite robust built-in inventory management tools. Besides, there is a collection of payment solutions. And you can get unlimited product options without third-party extensions or reach more customers and grow your sales with built-in SEO management, newsletters, CRM, etc. At the same time, you can connect with dozens of powerful apps and integrations adding advanced functionality to your site. Created by certified technology partners, third-party solutions are reliable and worth your attention. You can try Volusion for free for 14 days. If the platform suits your needs, it is possible to get a store builder, ecommerce software, and a marketing hub – all in one. Volusion offers several plans: Personal – for $29/mo, Professional – for $79/mo, Business – for $299/mo, and Prime – which has no exact price since it is used for custom solutions. Note that all plans have no transaction fees! Let’s summarize what we know about Volusion. The platform lets you create a full-fledged e-commerce store without any technical difficulties, but the opportunities are limited in comparison with Magento: the ecosystem is small, features are not enough, etc. Let’s explore the Magento vs. Volusion chapter to see how various differences impact the position of both platforms in the market. This chapter is based on materials by SimilarTech. According to the website, Magento ascends, and Volusion descends. 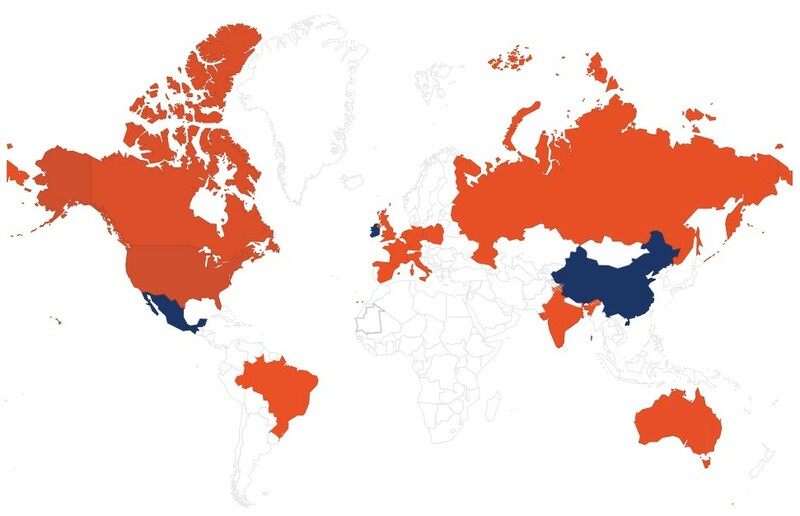 As for the volume of each ecosystem, the one around Magento includes 143,684 stores. As for Volusion, the platform is much smaller: it is home for 10,277 websites despite the fact that it is much older. Magento has better usage coverage in more websites categories including Shopping, Business & Industry, Arts & Entertainment, Health, and eight others. As for Volusion, it has a lead over Magento in Beauty and Fitness, Recreation & Hobbies, etc. Despite its age, Volusion is still far from being as popular as Magento. The following situation is caused by the platform’s limitations, the lack of free options, a small ecosystem, etc. All these disadvantages don’t let Volusion become a serious competitor for Magento 2 and are a reason to migrate from Volusion to Magento 2. Let’s see how to do that. The following chapter explains how to migrate from Volusion to Magento 2 in the easiest possible way. It also describes how to synchronize the data flow between the two platforms. While the most evident way to migrate from Volusion to Magento 2 is to use the default import tools, we don’t recommend you to do that, because of many difficulties that may occur. The default import and export instruments are very limited and will never help you complete the migration. By default, you cannot automate data transfers or map third-party attributes in the Magento admin. That’s why it is necessary to install an external module to run the complete Volusion Magento 2 migration. Several parameters are essential for seamless data transfers between Magento 2 and Volusion or other external systems. First of all, the chosen module should support all Magento 2 entities. Next, it should be able to automate data transfers. Besides, your solution should solve the problem of different attribute standards. The only Magento 2 extension that combines all these features is the Improved Import & Export extension – a module developed to move any data to and from your e-commerce storefront seamlessly running the Magento 2 Volusion migration as well as connecting your store to all possible external systems including ERPs, CRMs, marketplaces, databases, etc. Let’s see how to import any data from Volusion to Magento 2 in a few clicks using data file transfers or API connections. Export products, orders, customers, catalog, and other entities in XML or CSV formats from your Volusion website. If the desired functionality is not provided by default, you have to rely on third-party specialists. All additional Volusion solutions are available here: Volusion Solution Providers. 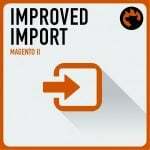 Now, import data files to the Magento 2 website with the help of the Improved Import & Export extension. 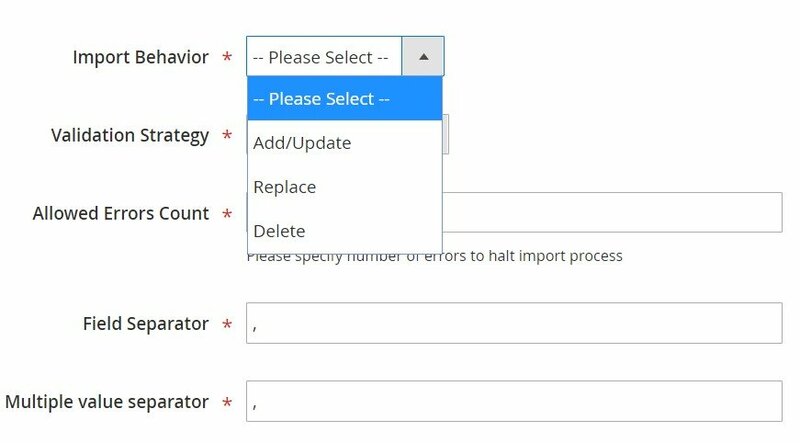 Create a new import job under System -> Improved Import / Export -> Import Jobs in the Magento 2 admin. Match Volusion attributes to ones used in Magento 2. You can use either a mapping preset or the extension’s matching grid. Don’t forget to create a separate import job for each entity. Otherwise, you won’t complete the Volusion Magento 2 migration. Contact our support here to get more information: Firebear Help Center. We will help you run the Magento 2 Volusion migration on the basis of data files. 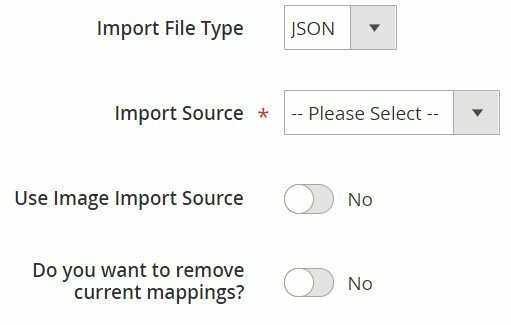 In Import Source, select a type of the import file: the Improved Import & Export extension lets you run the Magento 2 Volusion migration using XML or JSON. Next, choose its source: it can be either REST or SOAP. Configure other parameters to continue. Validate the data file in the end. Next, map Volusion attributes to Magento 2 attributes using presets or the grid manually. Otherwise, the further import procedure will be interrupted. Create a separate import job for each entity and run multiple import processes to migrate from Volusion to Magento 2 via API. For further information, contact our support here: Firebear Help Center. You will get help regarding the Magento 2 Volusion migration via API. If you want to run the migration between Magento 2 and Volusion in several stages or need to sync both stores, the Improved Import & Export extension will be helpful as well. Using either data files or APIs is possible. 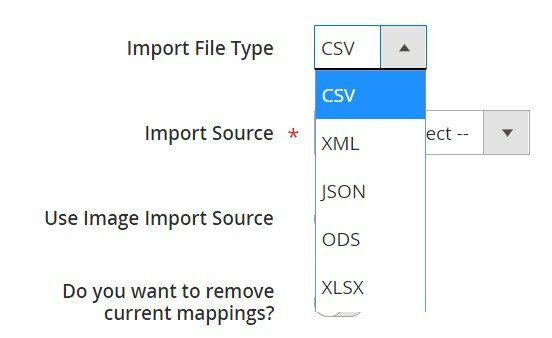 Go to your Volusion website and export products, orders, customers, catalog, and other entities in XML or CSV formats just like in the example mentioned above. If the desired functionality is not available by default, you have to rely on third-party specialists. All additional Volusion solutions are provided here: Volusion Solution Providers. Apply a mapping preset or match attributes manually to make the Volusion output suitable for Magento 2. 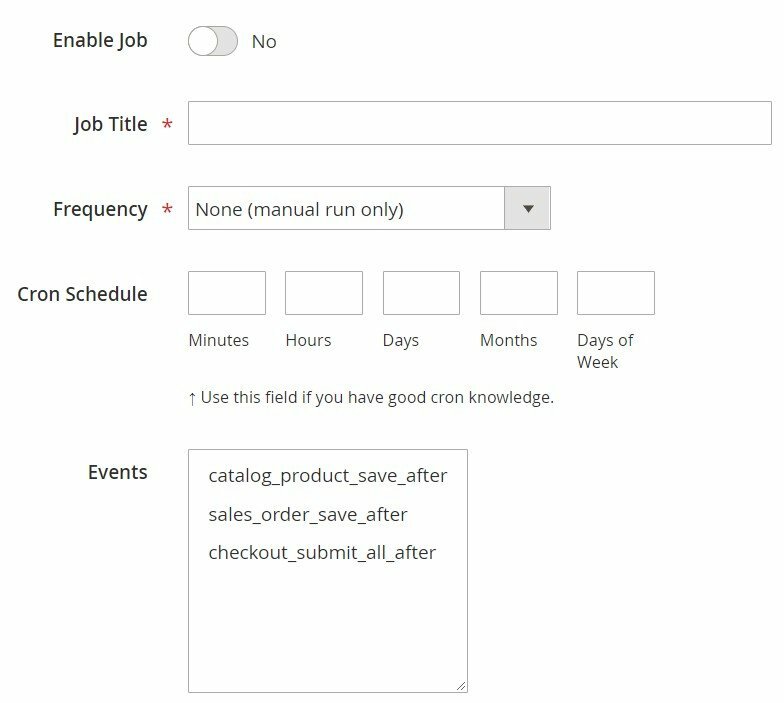 Create a separate import job for each entity to synchronize the entire data flow from Volusion to your Magento 2 website. Now, we’d like to draw your attention to another side of the Magento 2 Volusion synchronization. The following guide illustrates how to provide your Volusion website with the Magento 2 data. Enable data import on your Volusion website. If the desired functionality is not available by default, you have to rely on third-party specialists. All additional Volusion solutions are provided here: Volusion Solution Providers. 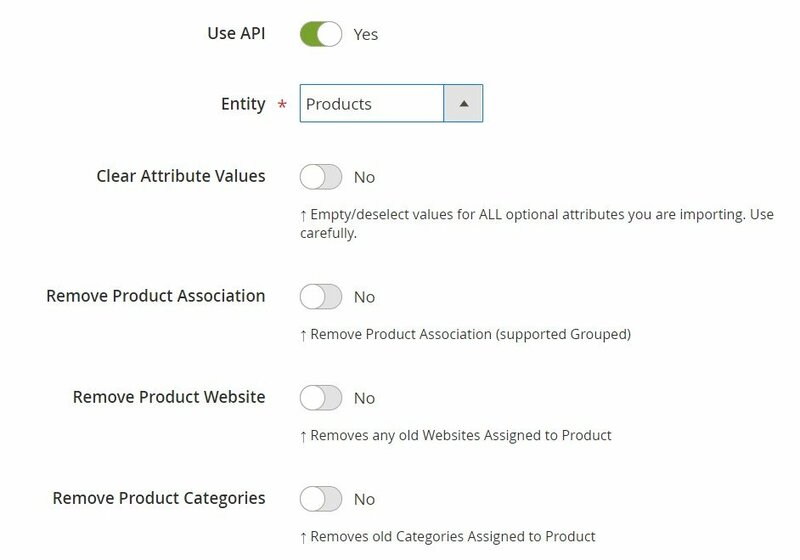 Apply mapping and filters, matching Magento 2 attributes to ones used in Volusion. 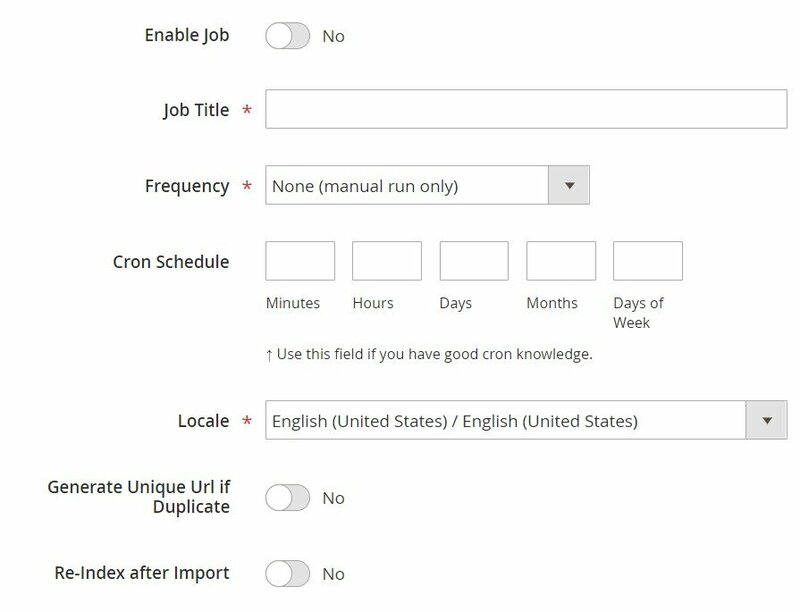 Don’t forget to create a separate export job for every entity used in the Magento 2 Volusion synchronization. Save and launch all import and export jobs to synchronize the two systems using data files. To find more information, contact our support here: Firebear Help Center. We will help you explore all the opportunities related to the Magento 2 Volusion migration via data files. Besides, the Improved Import & Export Magento 2 extension provides the ability to synchronize Magento 2 and Volusion via API. The module lets you move all the necessary information from your old store to a new one via REST or SOAP. The procedure starts in your Magento 2 admin as well: create a new import job under System -> Improved Import / Export -> Import Jobs. Apply mapping to match attributes used in Volusion to the corresponding Magento 2 designations. 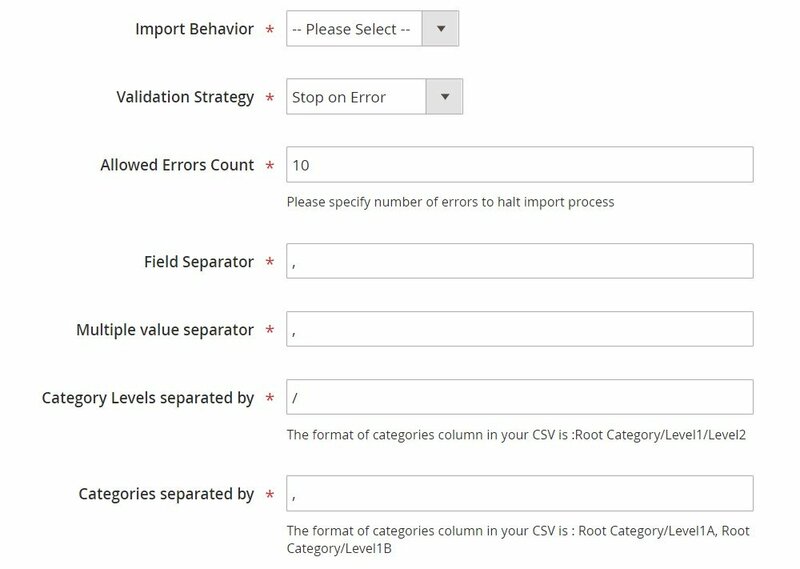 Create and configure a separate import job for each entity. Thus, you will enable multiple import processes synchronizing data transfers from Volusion to Magento 2 via API. Also, create corresponding export jobs to provide Volusion with the Magento 2 data. For further information, contact our support here: Firebear Help Center. We will help you with the Magento 2 Volusion migration via API. Now, when you are familiar with the Magento 2 Volusion migration, we’d like to draw your attention to the Improved Import & Export features that simplify the procedure. As mentioned above, our extension completely revamps the default import and export processes providing the ability to avoid recreating your old e-commerce store on a new platform manually. With our tool, all data transfers between Magento 2 and Volusion can be automated, different external attributes and their values – matched to ones used internally, multiple file formats – leveraged in the migration, and all entities – imported/exported! As a result, you effortlessly migrate from Volusion to Magento 2. The migration from Volusion to Magento 2 is usually a one-time procedure, so it doesn’t require automation. As for the synchronization of the two platforms, it is based on regular data transfers. We provide you with the ability to delegate all your daily duties to Improved Import & Export. And the extension allows automating data transfers in two different ways: via schedules and event-based triggers. Thus, transferring data to Volusion or other external systems with the help of a trigger, which launches various export processes after a certain action occurs, is also possible. The same functionality can be leveraged for import processes. 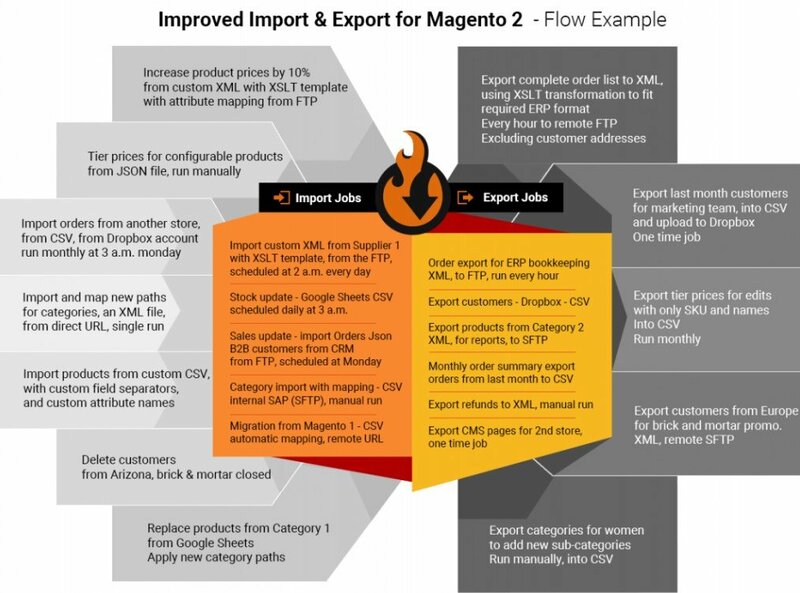 Read this article for further information: How to Run Magento 2 Import or Export After Specific System Event or Process. Use our module to solve the problem of different attribute standards without headaches and enable the Magento 2 Volusion migration in the most intuitive way with mapping presets – predefined mapping schemes that reduce manual attributes matching. As for the “Default Value” column, it is designed for hardcoded attribute values, which are provided to all items of a corresponding attribute. For instance, the feature lets you transfer product data from your old Volusion store replacing multiple old categories with a new one. Specify a hardcoded value for the “_store” attribute, and the Improved Import & Export extension will replace the third-party catalog elements with the specified one. 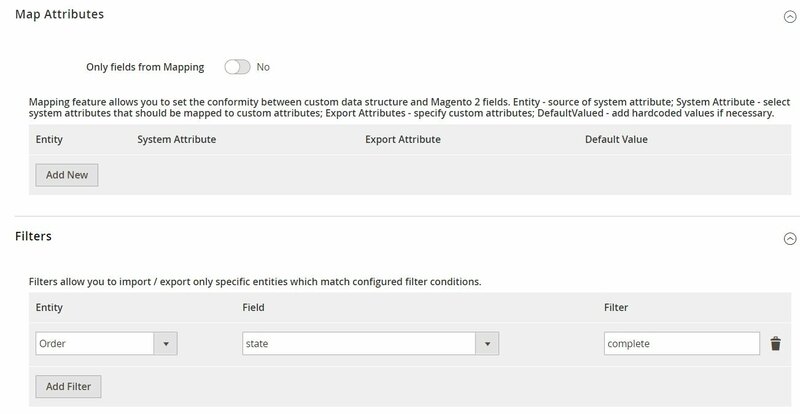 The Improved Import & Export Magento 2 extension offers a separate interface for attribute values mapping that provides the ability to automate the Magento 2 Volusion synchronization. Third-party designations will no longer interrupt data transfers: choose an external value and specify the internal one in front of it. Repeat the procedure until all external designations from your old Volusion store are replaced. The created schemes will be saved and applied for further updates. That’s it! For details, read this article: Attribute Values Mapping. Note that you can combine them and create conditions to increase the efficiency of the applied changes. For further information, read this article: How to Modify Attribute Values During Import and Export in Magento 2. Creating new categories on the fly is possible as well: choose a parent category and specify a new one. 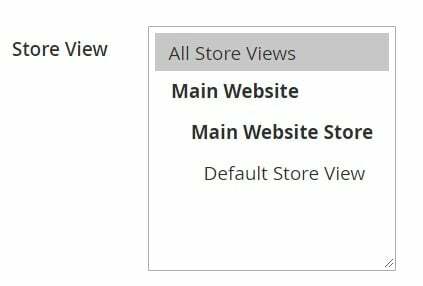 If your new Magento 2 store doesn’t include a category from the Volusion website, it’s no longer a problem. You can find more information about this feature here: Category Mapping. Below, we shed light on the extended connectivity options introduced in our module. They improve all data transfers including the Magento 2 Volusion migration. You not only get an increased number of supported file formats but also two alternative ways of transferring data between your e-commerce store and external systems. Also, note that it is possible to move all Magento 2 entities, while the default Magento tools support only several options. Besides, they work with CSV files only. The Magento 2 Volusion migration on the basis of the Improved Import & Export extension can be performed leveraging XML and JSON file. Besides, you can transfer ODS and Excel files for other integrations. Another feature that radically simplifies data transfers between Magento 2 and other platforms is an opportunity to import compressed data which is based on the module’s ability to unpack file archives automatically. As for the alternative ways of import and export, they are represented by direct API connections and intermediary services. Let’s say a few more words about each approach. To connect Magento 2 to Volusion, the Improved Import & Export extension provides the ability to leverage REST or SOAP APIs. Note that our module also supports the GraphQL standard. All API connections are fully compatible with the extension’s features so that you can streamline mapping, schedules, attributes on the fly while transferring data via API.